Lemon Lime Float for the Win! Looking for a refreshing beverage to serve for a special occasion or your next party? 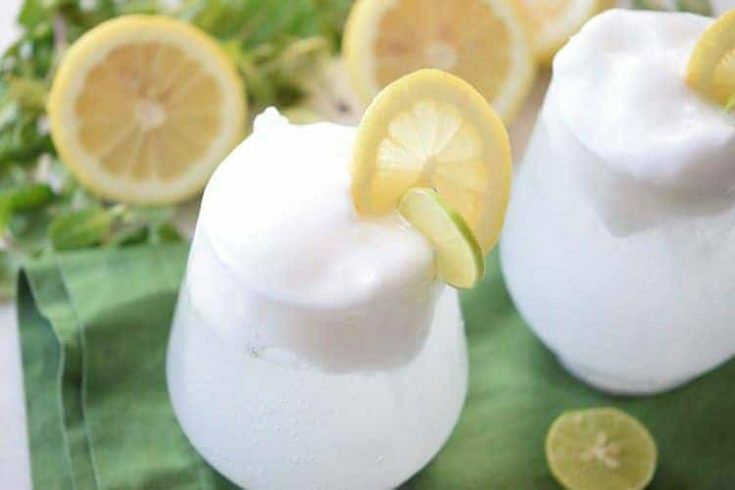 You’ll want to try our Lemon Lime Float recipe for sharing at a shower or kids party. Add a small amount of alcohol and you’ll have a delicious adult punch. No ice is needed to keep this drink cool…the ice cream does the job for you. If you’re planning a shower, you’ll want to order cocktail napkins to color coordinate your event. Shower planning can be fun and simple, as long as you have a plan. These Lemon Lime Floats are festive and delicious. You’ll love how easy this recipe is to throw together. Not to mention, how incredible they are to serve up to friends and family. If you’re looking for a drink recipe that includes alcohol, you’ll love our Strawberry Rum Punch, Mojitos, and Cranberry Margaritas. We love our fruity drinks around here. When it comes to drink recipes, this one takes the cake. We’ve had our share of floats: Strawberry Ice Cream Soda, root beer floats, coke floats, and so on. But this one is a little bit different with the lemon lime flavor that begs to be sipped on. Once you have your party planned out, you’ll want to pick up some paper straws for your drinks. If you plan to serve food, we highly recommend single serving appetizer and dessert bites. These are elegant and quaint, and can be served in mini dishes that are disposable, which will make cleanup easier. The key to every successful party is creating a simple yet elegant gathering that is stress-free and attractive. All the best party decor layouts have party banners that can be personalized according to the occasion. Cut and squeeze the lemons. Pour the lemon juice into a jar. Add the lime soda and mix it. Add a scoop of ice cream into glasses. Pour the soda and lemon juice into them. Garnish with the key lime and lemon slices.